Bone china is a type of porcelain that is composed of bone ash, feldspathic material, and kaolin. It has been defined as "ware with a translucent body" containing a minimum of 30% of phosphate derived from animal bone and calculated calcium phosphate. Bone china is the strongest of the porcelain or china ceramics, having very high mechanical and physical strength and chip resistance, and is known for its high levels of whiteness and translucency. Its high strength allows it to be produced in thinner cross-sections than other types of porcelain. Like stoneware it is vitrified, but is translucent due to differing mineral properties. In the mid-18th century, English potters had not succeeded in making hard-paste porcelain (as made in East Asia and Meissen porcelain) but found bone ash a useful addition to their soft-paste porcelain mixtures, giving strength. This became standard at the Bow porcelain factory in London (operating from around 1747), and spread to some other English factories. The modern product was developed by the Staffordshire potter Josiah Spode in the early 1790s. Spode included kaolin, so his formula, sometimes called "Staffordshire bone-porcelain", was effectively hard-paste, but stronger, and versions were adopted by all the major English factories by around 1815. From its initial development and up to the latter part of the 20th century, bone china was almost exclusively an English product, with production being effectively localised in Stoke-on-Trent. Most major English firms made or still make it, including Fortnum & Mason, Mintons, Coalport, Spode, Royal Crown Derby, Royal Doulton, Wedgwood and Worcester. 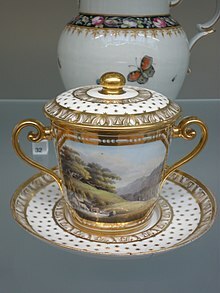 In the UK, references to "china" or "porcelain" can refer to bone china, and "English porcelain" has been used as a term for it, both in the UK and around the world. The first development of what would become known as bone china was made by Thomas Frye at his Bow porcelain factory near Bow in East London in 1748. His factory was located very close to the cattle markets and slaughterhouses of Essex, and hence easy access to animal bones. Frye used up to 45% bone ash in his formulation to create what he called "fine porcelain". Later, Josiah Spode in Stoke-on-Trent further developed the concept between 1789 and 1793, introducing his "Stoke China" in 1796. He died suddenly the year later, and his son Josiah II quickly rechristened the ware "Bone china". Among his developments was to abandon Frye's procedure of calcining the bone together with some of the other raw body materials, instead calcining just the bone. Bone china quickly proved to be highly popular, leading to its production by other English pottery manufacturers. Both Spode's formulation and his business were successful: his formulation of 6 parts bone ash, 4 parts china stone and 3.5 parts china clay, remains the basis for all bone china, and it was only in 2009 that his company, Spode, went into receivership before eventually being purchased by Portmeirion. In more recent years production in China has expanded considerably, and the country is now the biggest producer of bone china in the world. Other countries producing considerable amounts of bone china are Bangladesh, India, Indonesia, Iran, Sri Lanka and Thailand. From the start of the first factory, Bengal Potteries, in 1964, bone china output from Indian factories had risen to 10,000 tonnes per year by 2009. Rajasthan has become a hub for bone china in India, with production in the state totaling 16-17 tonnes per day. In the 21st century, "Islamic bone china" became available, using only bone ash from halal animals, as well as (more conventionally) clay and a high firing temperature. Due to the use of animal bones in the production of certain bone china, some vegetarians and vegans avoid using or purchasing it. ^ By The British Pottery Manufacturers' Federation, and quoted in Dictionary Of Ceramics. Arthur Dodd & David Murfin. 3rd edition. The Institute Of Minerals. 1994-1995. ^ a b c Ozgundogdu, Feyza Cakir. “Bone China from Turkey” Ceramics Technical; May2005, Issue 20, p29-32. ^ a b c d 'Trading Places.' R.Ware. Asian Ceramics. November,2009, p.35,37-39. ^ Karwatka, Dennis. "Josiah Spode and His World-Famous Pottery." Tech Directions; Apr 2009, Vol. 68 Issue 9, p12-12. ^ "Stoke kilns fired up for Spode again". Staffordshire Sentinel. Nortchliffe. 2009-04-24. Retrieved 2009-04-25. ^ ‘Pottery Science – materials, process and products.’ Allen Dinsdale. Ellis Horwood. 1986. ^ a b 'Cup And Sources- Asian Tableware Leads The Way'. Rohan Gunasekera. Asian Ceramics July / August 2013. ^ a b Skeletons In The Cupboard. Asian Ceramics. February 2013. ^ Bangladesh Tableware. Asian Ceramics February 2012. 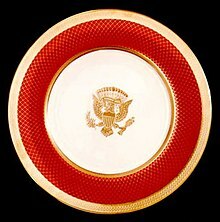 ^ Indian Bone China - Serving Up Opportunities. Asian Ceramics. March 2009. ^ Bulls In The China Shop. Asian Ceramics. Asian Ceram. February 2003. ^ "Vegetarian Society - Fact Sheet - Veggie Aware A-Z". The Vegetarian Society of the United Kingdom Limited. Retrieved March 21, 2015.